NEW YORK (WABC) -- Officials are investigating a possible small engine fire on a plane at New York's Kennedy Airport. Aerolineas Argentinas flight 1301, bound for Buenos Aires, was sitting on the runway after experiencing an engine fire around 11 p.m., sources said. People on the ground said they heard a loud bang. Other pilots reported seeing a fire. A spokesman for the Port Authority of New York and New Jersey said the pilot reported the engine fire while the plane was preparing for takeoff. But, Steve Coleman said when rescue trucks arrived they found no evidence of a fire. The plane taxied back to the gate for further examination. No injuries were reported. 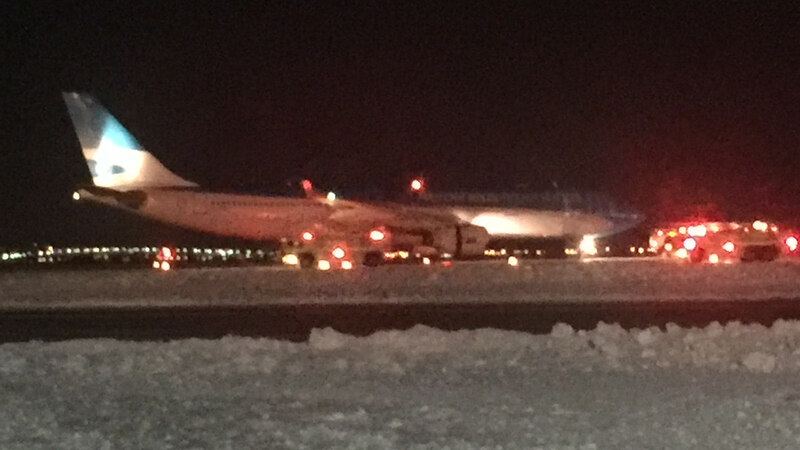 The runway was closed and the plane was quickly surrounded by emergency vehicles. The plane taxied under its own power off the runway.